Our Membership Management System truly is one of the best you'll ever find. It is a comprehensive and highly flexible membership system that can be configured to mould around your membership environment. Rather than forcing you to change your operations to suit the membership software. 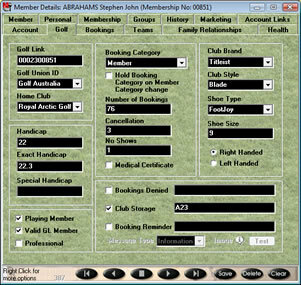 Golf Computer Systems Membership Management System (MMS) is a comprehensive and highly flexible membership management and CRM software application incorporating recording, reporting, billing, accounting, marketing and member communications functions. The system stores a wealth of membership information, and is highly configurable to enable its presentation and behaviour to be tailored to suit the varying needs of different types and styles of membership situations. The software has been written to meet the specific needs of club and association memberships, and can also be used as a database and marketing tool for non-members and prospects. MMS shares data with other applications from Golf Computer Systems such as bookings, POS and golf management, to ensure that entry of information is not required to be duplicated. Membership systems have traditionally held a relatively static set of information about members, offering little flexibility in the depth of detail able to be recorded against each member. Recognising that the needs of clubs vary greatly based upon factors such as levels of technology employed, operational issues, club policy and staffing, we have built our membership software to provide the flexibility to be moulded to suit these varying operational needs. Flexibility is a key feature or the software. Examples of this flexibility include the ability to define and then record any number of different addresses against each member, multiple contact names or numbers against each of these addresses, define any number of mailing lists and link them to the appropriate member address, build groups for members such as corporate groups, family groups etc., and see the relationship and details of members of these groups against each members record. Member information which is selected from pick lists such as category, marital status, title etc. is not determined by us, but instead is built into the system to enable you to compile these pick lists yourself, so the information selected is then fully appropriate and meaningful to your operation specifically. With the changing composition of club membership now often incorporating a variety of member categories - restricted access members, social members, gaming members, non-playing members etc. - we have ensured that the varying requirements of maintaining these category types have been fully addressed. 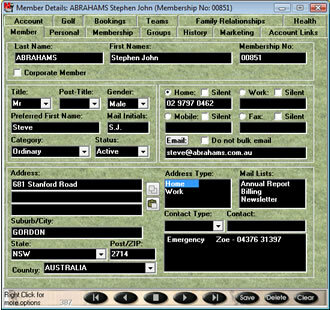 Selection of member records can be "filtered" by a host of methods - category, gender, age, duration of membership, family group, corporate group, areas of interest to name a few - and each of these filters can be applied in combination with each other, allowing extensive profiling of your membership base. This provides for varied opportunities in marketing and promotion and of course in understanding the patterns of usage and preferences of your members. Identification of members at point of sale or any other point of interaction with the clubs' technology can be via magnetic stripe card, barcode, proximity device, member number, or name. The system can encode and print member cards and allows you to record multiple member numbers or card types against each member. Any recorded member card will identify a member at a cash register as readily as would his credit card for example. The mailing list features of the membership software are especially useful and flexible. Any number of mailing lists may be set up within the software. Mailing lists are identified by name, so for example you might elect to call one list "Monthly Newsletter" or another list "Annual Report". The frequency at which these mailing lists are to be generated may also be entered with the list details, thereby allowing the automated production of mailing labels, envelopes, or personalised documents by the system on the appropriate dates. Every member can be attached to any or all mailing lists, and because you can record multiple addresses per member, you can then select to which address each mailing list item is delivered. Just as mail can be generated to a physical address, so too can mailing lists or general correspondence be generated via e-mail from within the system. Individuals can be e-mailed from within the member maintenance area, or via the reporting module members, member categories, or the entire membership can be e-mailed via a broadcast. An opt-out option allows you to prevent individual members being included in broadcast e-mails if required. 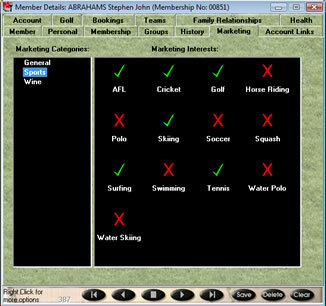 A marketing module within the membership software allows you to create lists of information against which members can be profiled. By way of example, a list may contain areas of interest such as Biking, Bush Walking, Camping, Skiing, Sailing, Travel, Wine, etc.. This list is then displayed on the marketing page of each member´s record, with a check box alongside. Where a member has identified himself as having one or more of these interests, the check box is ticked and thereby recorded against the member. You can then attach a mailing list to an area of interest and instruct the computer to generate a report, a letter, mailing address labels, or email to each applicable member. The marketing opportunities which can be implemented via this feature are limitless. Members may join themselves into mareting categories, marketing interest groups, or mailing lists online via our Online Membership module, i-MMS. 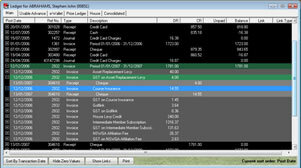 The software manages the production of subscription or dues notices. Subscriptions may be charged periodically, (yearly, half-yearly, quarterly etc.) or may be generated based on the anniversary of the joining date of each member. Fees such as member subscriptions, nomination fees, affiliations and levies can be established in the accounting modules, and these fees can then be linked to member categories. In doing so, each member in a category automatically inherits the set of fees linked to that category. Additionally, fees may be linked directly to individual members, thereby bypassing the category linking described above. A locker fee for example is likely to apply to an individual rather than to all members in a category. The ability to link fees to an individual member takes care of this situation. Individual members can also be exempted from specific fees to which they would otherwise be linked via their membership category. Any or all fees may be pro-rated, and the pro rata calculation may be varied per fee by allowing you to specify the pro rate base (year, quarter, month, etc.) and the pro rata divisor (month, week, day etc.). The method by which the computer is to handle a partial pro rata period is also definable. Fees may be set up to charge to only one gender of member, and may be set to round up or down to a specified multiple, thereby removing cents from calculations for example. The frequency with which a fee is charged is similarly definable to accommodate half yearly fees or monthly fees which may be applied outside of the usual annual billing process. Fees may be flagged as being taxable (including GST and VAT), and may also be flagged to disable them, thereby excluding them from billing runs. Just as the system is able to bill members, it can of course process member receipts, credits notes, and adjusting journal entries. A full analysis of monies received and the allocation of receipts against fees charged may be produced in the system. to provide the revenue due from instalments year by year if required, or due each quarter as in the earlier subscription example. A comprehensive direct debit system is incorporated into the account functions allowing you to process periodic direct debit charges against member´s bank or credit card accounts for payment of subscriptions or charges. Fees can be selectively tagged for direct debit payment, or all fees can be applied for direct debiting. Fees can be separated from journals to allow differing behaviour for direct debit purposes. All point-of-sale transactions can be directly debited in the period in which they occur, while subscriptions can be billed over the period remaining until the member´s renewal for example. Direct debit payment holidays can be applied to selected members by placing the member "on hold". The held over charges can then be applied to the next direct debit processing, or can be apportioned over the remaining direct debit periods up until the member renewal date. Direct debit authorization forms can be generated by the system, as can direct debit payment schedules per member. In the case of credit card direct debiting, credit card numbers are automatically validated upon entry into the system to ensure that keying errors do not affect the bank processing. The system produces standard ABA files for transmission to the bank, either for credit card direct debiting, or bank account direct debiting, and receipts member accounts automatically upon acceptance of the produced file. Defaulters are easily processed by retrieving the direct debit batch and unchecking their transactions, thereby reversing the direct debit receipt and automatically applying any default penalty charges. 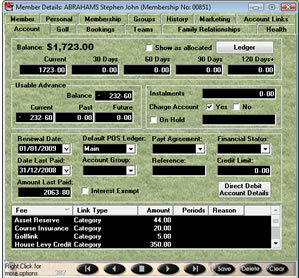 All transactions are displayed on the member´s ledger. They are also recorded in the transaction audit trail. Pre-payment of future fees can be accepted, in which case the member renewal date can be applied to a future date, years beyond the general renewal date if necessary. Transactions are able to be adjusted in the system. This is a feature you can choose to activate, or turn off completely. You may specify the number of days after creation of a transaction that that transaction may be altered or adjusted. This assists in reducing journal adjustments to member accounts. Transactions can not be adjusted after a financial period is specified as “closed” to ensure that the financial integrity of the system remains intact. Access to the ability to allow or disallow transaction adjustment is security protected. Adjustments are recorded in the audit trail. Transaction reporting provides detailed and comprehensive listings and analysis of financial transactions relating to specified accounting periods. Transactions may be posted to financial periods outside of the current posting period, provided the period has not been closed. Detailed revenue reporting is available based both on invoices generated and payments received. 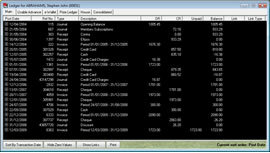 The same reporting module provides a summary of charges or receipts by fee, and in the case of receipts, a summary of receipts by tender type. Bank deposit reports allow deposit slips to be generated, or regenerated for reconciliation purposes. Interest may be charged on overdue accounts. You may select certain fees on which interest is chargeable, and exclude others. The annual rate of interest may be set per fee. In the case of taxes, interest may be excluded from being charged on the tax component of an outstanding balance, and interest may be excluded from being taxed when charged. Discounts may also be offered for prompt or early settlement. Discounts may be limited only to selected fees if required, and the discount percentage may be varied fee by fee. Discounts may be at a fixed value or percentage per fee. Invoices may be set up to show a total amount of billing, less a calculated discount, and then display a net amount and an early settlement cut off date. Messages may be entered in to the system for notification to individual members, or to all members in a specified category or range of categories, or simply to all members. We offer a touch screen kiosk/terminal which can be located in a public area of the club to enable members to interact with information on the database as the club sees fit, including messages. Messages are also presented at member logon on the Internet via the web membership module, i-MMS. The member can deactivate message once read. This process is time and date stamped and logged for your records to show receipt of a message by the member. Access systems such as door entry can be tied into membership records and controlled via the member access feature, and in fact we offer a separate door entry system that is fully integrated to the database. The system can be installed with our other applications such as our Facility & Activity Scheduling System, and Golf Manager, and will automatically share appropriate data with these applications. This modular approach means that our full suite of management software can be installed progressively as the need for additional modules arises. The fully multi-user software is a 32-bit client/server Delphi application, and requires Windows 2000 or better to operate. Minimum display resolution recommended is 1024x768 in 16-bit high colour. Higher resolutions and more recent operating systems are recommended where available. Multiple membership numbers available per member. Multiple contacts per address per member. Multiple mailing lists per address per member. Multiple e-mailing lists per address per member. Family member linking displays family members on each members record. Family relationships display on member records. Marketing information such as member interests are fully user-definable. Corporate members as well as individuals. Member category change history, date and comments are recorded. Members can be grouped in any number of groups for reporting purposes. Detailed ledger with full transaction drill-down. Transactions may have separate posting dates. Periodic billing may be yearly, half-yearly, quarterly, monthly etc..
Ability to apply non-standard billing across membership outside of billing cycle. Ability to bill selected categories based on anniversary of member joining dates. Manual billing calculates pro rata charge through a partial billing period. Non-standard fees can be applied to any manual invoice as necessary. Family billing to single account. 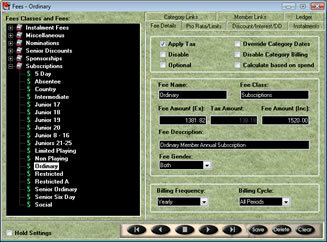 Ability to alter fee amounts on manual invoices. Any fees can be applied on pro-rata basis. Automatic tax calculation included where applicable. Ability to exclude selected fees from tax charging. Multiple taxes can be applied on a fee by fee basis. Comprehensive fee installment billing and tracking. Automatic billing of installment administration fees. Comprehensive periodic Direct-Debiting of member bank or credit card accounts. Direct-Debit setup, billing and dishonor fees may be automatically applied. Direct-Debit rules may be applied to individual fees, transaction types, or members. BPay processing of bank files. Fees such as levies can be limited to a number of times charged or a total value charged over time per member. Early payment discounts may be incorporated on invoices at fixed or percentage rates. Charging of penalties for late payments. Charging of interest on overdue fees can be limited to selected fee types. Interest charging at fixed or annual rate. Gratuity charging rules may be applied by fee and/or by member category. 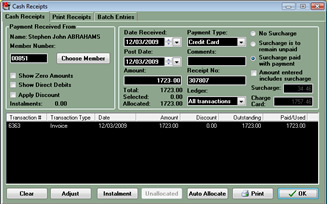 Point of sale transactions can be accepted to the member's ledger via a live interface, either in summary or detail. Receipt printing - user-definable layout. Bank deposit documentation may be produced from receipting data. Billing address hierarchy may be applied. Cash or accrual financial reporting. Detailed revenue analysis available both on billing and receipting transactions. Aged trial balance includes installments owing, outside of aged balances. Ability to adjust transactions in user-specified time frame. User definable messages for printing on invoices. Card swipe recognition of member. Membership card sequencing and printing. Proposer, seconder and referee details recorded. Wide variety of reports and report filtering. E-mail broadcasting from within the system. Utility to quickly build mailing lists and attach members to mailing lists. Report designer incorporated to allow user-designable report layouts. SQL explorer and reporting tool. Data export features for use in spreadsheets and mail merges. Login security and restrictions by staff member. Address change history automatically recorded.